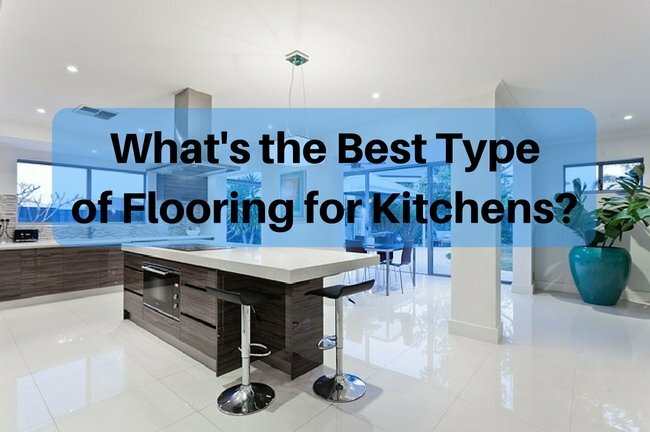 When it comes to Kitchens, what is the best flooring choice? 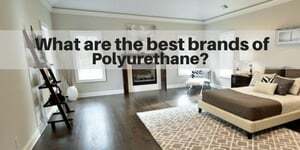 Which types of floors are most durable? What are the Pros and Cons for Kitchen flooring options? The kitchen is the heart of the home, and for many families, it’s the one room that you spend the most time in and gets the most foot traffic. So what is the best floor for a kitchen? Well, I would argue that there isn’t a BEST choice, but rather there are several great choices. 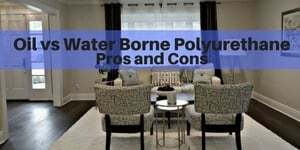 I would also say that there are pros and cons for each choice; you just need to determine which factors are most important for you, your kitchen and your family needs. I would also say the answers to some of these factors will vary a bit based on where you live (e.g. warm climate vs cool climate), and what type of sub-floor you have (e.g. plywood vs concrete…often related to climate/housing structures). And, of course, we have that other factor – BUDGET. 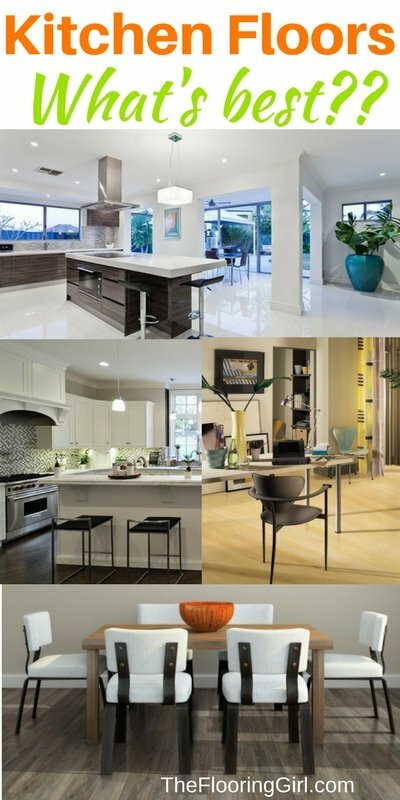 Thankfully, there are many great flooring options for kitchens that can work with your preferences and your budget. By far, the most preferred and popular kitchen flooring options are hardwood floors and tile. These are the most upscale, they last the longest and improve the value of your home. 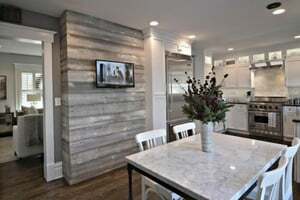 But, there are also some wonderful mid grade and niche items that are rising in popularity including Luxury Vinyl Plank/Engineered Vinyl Plank (e.g. Coretec Plus,Cork flooring and linoleum tile. Coretec Plus has been growing since it looks like hardwood and it’s waterproof. It’s also a very versatile product that can be installed on top of concrete, existing tile and can even be installed by some do-it-yourselfers. Cork and linoleum have been on the rise due to their green/environmentally friendly properties as well as comfort on your feet. And, of course, there are some more lower priced items, such as laminate, bamboo, sheet vinyl, etc. These would not be my first choices, but if you are very budget constrained, they will save you some money in the short term (they generally do not last as long, so in the long term, they will cost you more as they will need to be replaced sooner). 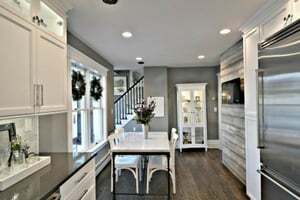 In Mid to higher end homes, the preference (and often expectation) is to use hardwood flooring or tile floors for the kitchen. These give your kitchen an upscale look, they are highly durable and they improve your home’s value. In my opinion, they are both great options. 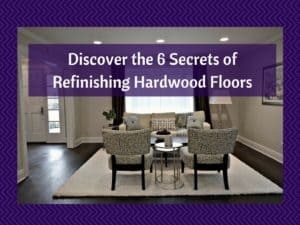 But, if I had to choose one over the other, I would probably recommend hardwood flooring for those in colder climates and tile flooring for those in warmer climates. 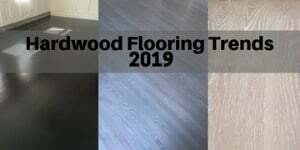 Please note that I’ve written a full in depth article on hardwood vs tile flooring for kitchens. 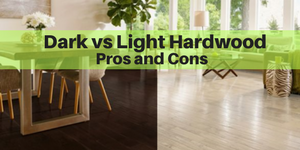 This is a quick summary of the Pros and Cons for both wood and tile floors. 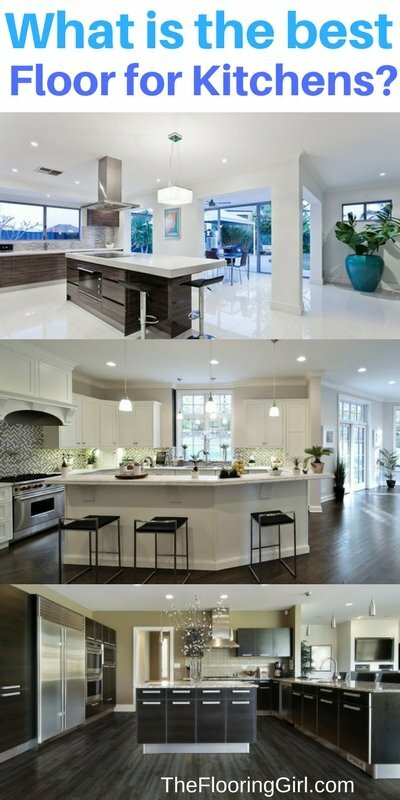 Read the full article here (hardwood vs tile for kitchens) for more details. 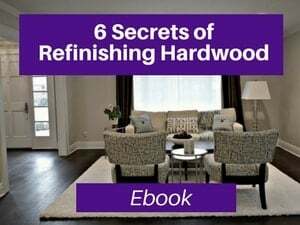 You will need to periodically refinish the floors (e.g. every 7 to 10 years). This is a bit of an inconvenience (but can be done while you’re away). Variety of colors, styles and shapes…including tiles that look like hardwood planks. Many design choices. Tile floors work well with radiant heat; they conduct the heat better making your feet warmer. 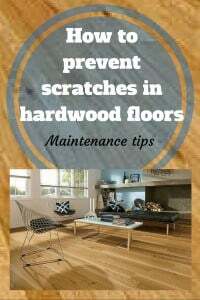 Please note that I would strongly recommend solid hardwood for kitchens over engineered wood. If you have a concrete sub-floor, and your choice is between engineered wood and tile, I’d probably recommend tile for your kitchen. Please also note that I would strongly recommend unfinished hardwood over pre-finished hardwood for kitchens. 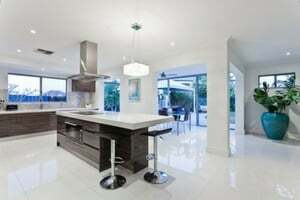 You can read a more in depth article about hardwood vs tile in kitchens in this article. 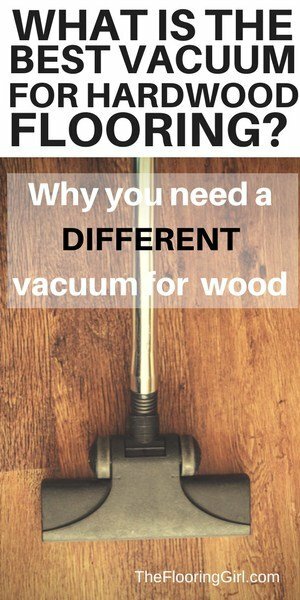 Real hardwood vs tile planks that look like hardwood – Pros and Cons for each. One of the most innovative products to hit the market place is Coretec Plus. I love this product. It looks like hardwood flooring, but it’s waterproof! Yes, waterproof, so it’s a great option for kitchens and other areas that prone to water or moisture. The product looks really real (and stylish of course), and in my opinion looks better than most engineered hardwood and head and shoulders above laminate floors. Coretec Plus has an attached cork underlayment, so it makes it a bit softer on your feet, as well as warmer (and it’s better for sound absorption). Coretec Plus can be installed on top of most surfaces including plywood, concrete and even tile (so if you don’t want to rip up tile, this is a great option). It comes in a variety of colors (from light to dark…and even grays). 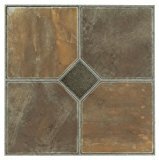 And, they do have this available in tile looks, too. You can read a full review of the product here. Coretec Plus is an engineered vinyl plank (meaning it’s layered in the same way that an engineered hardwood is constructed. It’s 8 mm thick so it has some dimensional stability and it helps make it feel like real hardwood flooring (and not like vinyl). There are other forms of luxury vinyl as well, such as glue down luxury vinyl. This is usually waterproof, too (but some of the cheap brands are not waterproof). A glue down vinyl is a good option when your floors are wavy and uneven and you don’t want to invest in leveling the floor. (This would occur more often in basements). 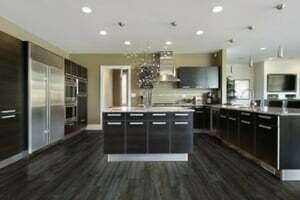 Cork flooring is also another great option for kitchens. It’s extremely water and mold resistant and it provides a great cushioning and softness for your feet. It’s unlike any other floor that I’ve stepped on. Cork floors also provide some insulation, so they are warmer on your feet. This will really come in handy during the winter in cooler climates as you’ll feel warmer (and you may even save a bit on heating bills). Cork is a green product and you can read more about how it’s made in this article: How is cork flooring made and how is it environmentally friendly? It’s really fascinating to understand the process for this unique flooring. Cork now comes in a variety of colors and patterns. 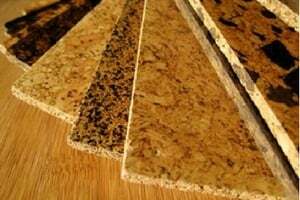 Most cork is in the form of flooring that floats and be installed on top of most surfaces including concrete and tile (as long as the surface is level). When kitchen items fall on a cork floor, they are unlikely to break (and BTW, this is also a nice option if you have an older family member as they are less likely to fall and injure themselves). One downside with cork is that it’s a very niche and taste specific product. Some people love love love it; others don’t like it at all. So, it’s generally not a good option if you are looking to sell your house soon. Linoleum has been growing due to its retro style and its green properties. Many do get the terms vinyl and linoleum mixed up (see this article: What’s the difference between linoleum and vinyl?). Linoleum is an eco-friendly product made with linseed oil; vinyl is a synthetic petroleum based product. Linoleum is a nice option for those looking for a colorful and/or a subtle retro look (could work a farmhouse look, too) and for those seeking a water resistant option. Linoleum comes in both rolls and tiles. The rolls are not very compatible for kitchens as they are 6.5 ft wide and most kitchens are of course wider than, so you would have seams in the middle (they can, however, work well in smaller bathrooms. Instead linoleum tiles work well, regardless of kitchen size, and they look nicer anyway. Also, you have the ability to do more than one color (e.g. do a checkered pattern) or even multi-colored and make a fun pattern (tends to work better for larger open rooms (such as a basement, rather than a kitchen which is cut out with cabinets). Note: Linoleum uses a specialized adhesive that is also eco-friendly (avoid using vinyl adhesive). The following items would not be products I would typically recommend for a kitchen. They are simply lower priced budget item. They each have some strong drawbacks. But, if money is the primary concern and these are all you can afford to do, they at least do provide some cheaper options. Sometimes people install these because it’s all they can afford; sometimes it’s because they are misinformed or don’t know any better, sometimes they do this because it’s a rental or they are selling their house and just want to spend the least amount as possible. I would not expect any of these to last that long. Laminate would not be my first choice for kitchens as it’s NOT waterproof. In fact, it’s almost the opposite as it can absorb water and moisture like a sponge. See this article: Is laminate waterproof? Many mistakenly install laminate in the kitchens (or basement) because they think it’s waterproof, but this is a mistaken assumption. And, many that are installing laminate in their kitchen are doing this because it’s cheap (and it is relatively cheap) and it’s available for a cheap price in some of the Big Box Stores. But, I will warn you that there is a a reason these laminates are cheap…and that’s because the use low quality materials and are cheaply made. They are most often made in China, and some may contain formaldehyde which isn’t safe (and it may not be CARB compliant. Many of these stores are under legal investigation, not just the one you can see in this 60 Minutes Investigation. But, even putting ethics and health aside, the cheap laminate products that you can buy simply don’t hold up well. 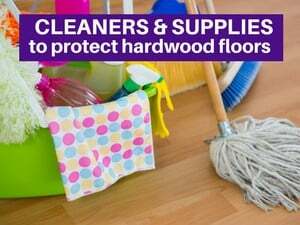 They delaminate rather quickly just from normal wear and tear, and normal cleaning (which of course exposes the floor to water). 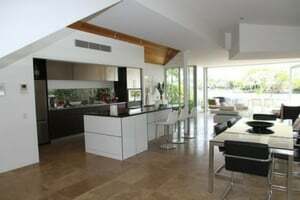 And, for rooms that more wear and tear and more moisture, like kitchens, they delaminate and wear down faster. 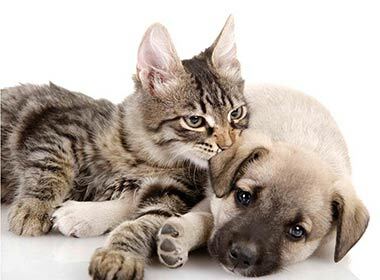 One advantage to laminate flooring is that they are relatively scratch resistant, so that can hold up pretty well if you have pets and a busy household. 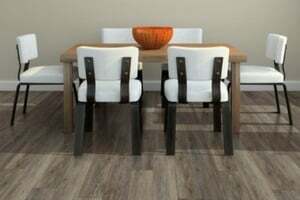 A second big advantage to laminate is that they can often be installed on top of concrete and tile (as long as the room is level and the sub-floor isn’t wavy. 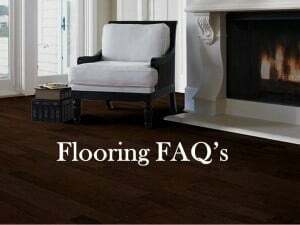 Now, I have made a bit of a general statement here about laminates because there are some high quality and more durable laminates out there, and those are way better than the more prevalent laminates that I see in most houses and those that are available in most Big Box Stores. But, if you are going to spend more on a good laminate, in my opinion, I would recommend switching to a more durable and waterproof luxury vinyl product such as Coretec Plus (see above). 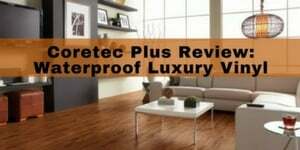 Unlike laminate, Coretec Plus is waterproof. (It would generally cost same or sometime less than higher grade laminates). Sheet vinyl would be much lower on my list as it’s less attractive. It looks cheaper and more dated. Sheet vinyl comes in 12 ft widths, and if your kitchen is wider than 12 ft (on both length and width), you will have a seam (which is not attractive and tends to wear down and separate over time. It also means that you’ll need to order more of it to cover this area. Sheet vinyl is actually rather challenging to install (it’s not a good project for a DIYer) and often requires extra prep work to smooth out the sub-floor. So, ironically, it’s often more expensive to install vs what people expect. This segment of the market had declined so much that there are fewer and fewer installers (and stores) that still install it,and there are fewer and fewer options available. Manufacturers have discontinued more and more items each year. Peel & Stick vinyl tiles are a cheaper DIY alternative to sheet vinyl. I often come across these in lower end rentals. You can buy these pretty cheap at some of the Big Box Stores. Of course, they look cheap, too and they don’t hold up that well. The adhesives are not very durable and do not hold up that well to water, so after prolonged use and cleaning, the adhesive often becomes dislodged and move/shift and this often looks sloppy and shows the sub-floor underneath. They also have a very thin wear layer so over time, this wears off and the the tiles become discolored from both the dirt and the sun. These types of vinyls are generally manufactured in China, so they are low quality and may have questionable materials/additives that may not be the best for your health. If you really can’t afford a mid grade product nor to pay an installer, this may provide a cheap temporary alternative until you can afford a better solution. Here’s one you can find on Amazon, and if you don’t like this style, they have several other options. Clearly, this would be my last choice for a flooring surface in a kitchen (and I would in fact recommend against this for sanitary reasons). Yes, this is not good for germs or dirt. 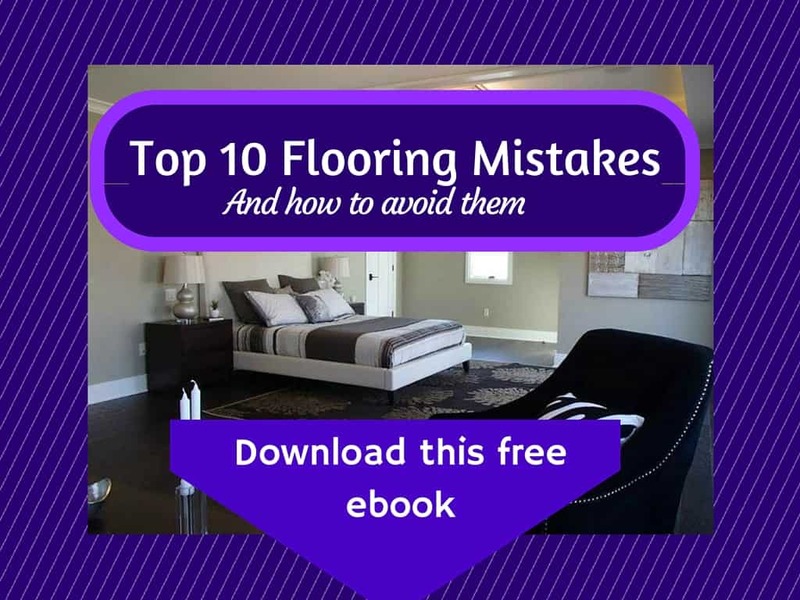 But, I have seen a few people do it (sometimes for aging pets…as a temporary flooring surface) and sometimes because they just can’t afford anything else (carpet is the least expensive flooring surface). Clearly this is not the norm and should only be used in rare and temporary circumstances. So what IS the best flooring option for kitchens? I’m sure by now, you’ve gathered that there is no one size fits all for kitchen flooring. It depends on which factors are most important to you as well as your budget. 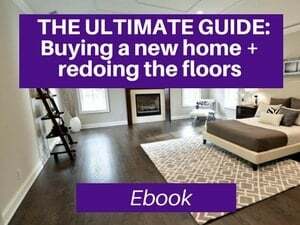 As a general rule, I’d say that the 2 best options are hardwood flooring or tile (assuming this fits in your budget). 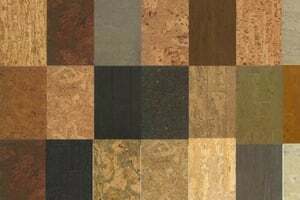 Thankfully, due to new technologies, there are now several great mid-grade flooring options for kitchens. In particular, Coretec Plus (and other luxury vinyl or engineered vinyl planks) is a great alternative and for when you want a wood look, but also a waterproof option. And, of course, cork floors and linoleum tiles are other great options for Kitchens. 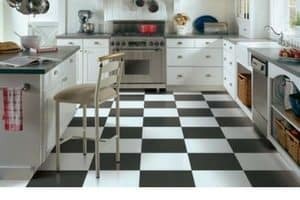 I hope you find this advice in the article helpful so that you can make the best choices for your kitchen floors. Feel free to leave a comment or question below, and I will get back to you as soon as I can. Should you install the kitchen cabinets or floors first? 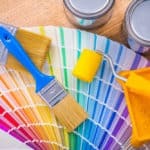 Which is the best order – painting or flooring first?. David – Thank you, and you’re welcome. Thank you for the article! It has already helped so much! We found a huge leak in our kitchen this past week. 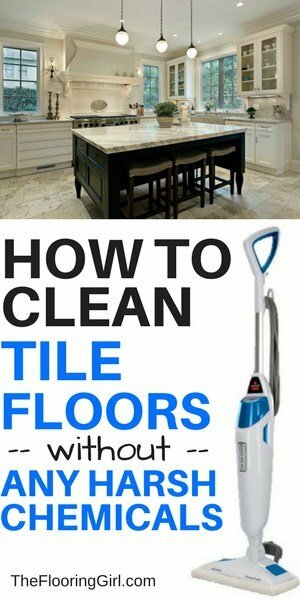 Laminate tiles on top of hardwood (water standing between the rubber and the hardwood….) 🙁 Anyway, I wish you were closer to KY, I am waaaay out of my element in trying to get this fixed!